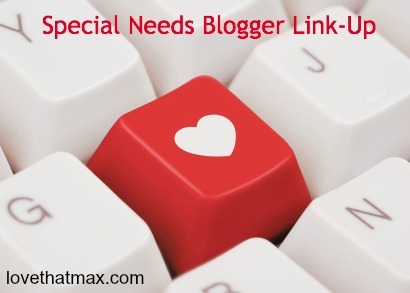 Love That Max : It's The Special Needs Blogger Weekend Link-up: Go to it! It's The Special Needs Blogger Weekend Link-up: Go to it! It's the Special Needs Blogger Weekend Link-up. Nice to see you! How have you been? You're looking good! Did you do something different with your hair? Note: A few people have had trouble posting using Internet Explorer. Try a different browser! Thanks Ellen. I linked to a post about persevering. Thanks, Ellen. Dexter's at #11 this week. We've shared a post about a typical day for Dexter. Happy weekend. My favorite day of the week in the blogging world! Love reading all of the posts and finding new blogs to follow! Sharing something that might seem like for the parent of older special needs kiddos, but I think it's good reminder for all.... Talking to your special needs child about tough stuff. Thanks for hosting! You've always have a great group of resources here. Today I posted about books my kids love. They also have many applications for school and therapy. The music therapist introduced them to us, but the OT and PT were fans, too. Happy Friday! Why Blue suits Autism Acceptance but we need to stop blueing! Somehow I missed this last week...putting one of last week's in today. :-) Thanks! Hi Ellen and everyone, I posted twice this week - I hope that's OK! I had a busy week - I travelled to Toronto for a book launch of the new paperback edition of my book and had a fun interview on morning TV. So, I shared that along with my usual blog post about enabling a more caring society. Have a great weekend, everyone! Congrats on paperback book launch! Anyone is always free to post two or more posts. So, my mom is an international autism specialist, an autistic individual, an autism mom and friend.... and her birthday is April, 2nd, world autism awareness day. It felt fitting to brag a bit about her and show off her gift giving nature! Thanks for giving us a place to share our stories Ellen!! LOVE that! And, my pleasure, Tsara. I'm curious to know if any of you have tried music therapy and what kind of results you've seen? So far, it has been a very positive experience for us. THis is my first time linking up! I hope you like my post!